The Challenge: Carson Cooman is a prolific American composer with over 1,000 musical works. He had been maintaining his own offline catalogue plus a website, and wanted to combine the two. He also wanted to update the visual style of his old site with a new take on the ocean-blue color scheme. 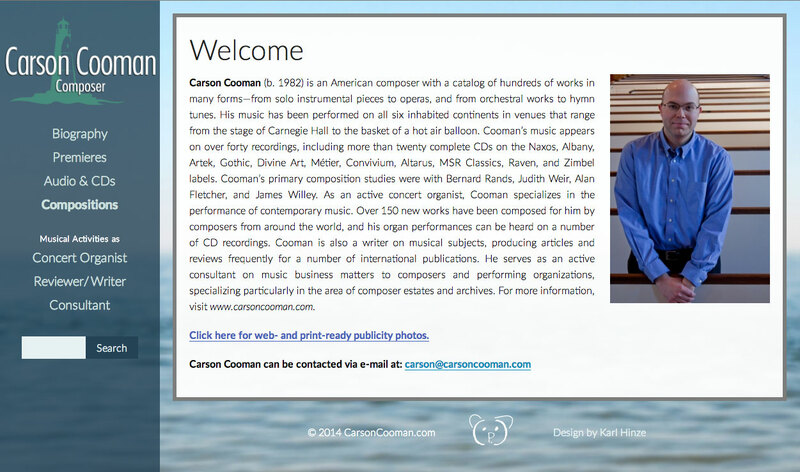 The Solution: Using a custom expansion of my Composition Manager for WordPress, I was able to create a solution for Carson to easily and beautifully house his massive catalogue of works. This was a very involved coding project, including new multi-faceted searching of the catalogue, plus linked CD objects that interface with his catalogue, and an additional internal database for Carson to track performances of his work.